I was too tired to read the political coverage in today’s Times on the train, so instead I delved into some of its human interest stories. A psychological quiz dividing people into wolves (competitive, like winning, hating losing) and sheep (embarrassed at winning, not bothered by losing) produces an inconclusive result. – I am a sort of sheep in wolf’s clothing. 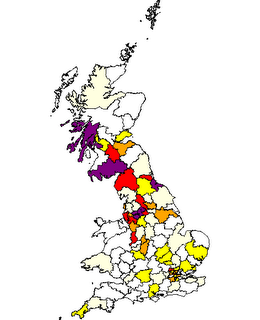 Meanwhile a UCL website showing geographical distribution of surnames across the UK in 1881 and 1998 shows Hanleys to be concentrated in the North West of England and West of Scotland (see graphic). 97% are English with a significant (3%) minority – like my good self – of Irish descent (hence the concentration in the West of Scotland, I guess). No Czech Hanleys, but one Hungarian in 1998 according to the stats.